Born in 1883, the daughter of a Dublin grocer, Helena Molony experienced an unhappy, if comfortable, childhood; orphaned in early life, she did not get on with her stepmother. As in many republican autobiographical narratives, she could identify a moment of political awakening: ‘I was a young girl dreaming about Ireland when I saw and heard Maud Gonne speaking by the Custom House in Dublin one August evening in 1903 . . . She electrified me and filled me with some of her own spirit.’ Like many of her generation, the cultural revival played an important role. ‘I had been reading Douglas Hyde—his history and legends. 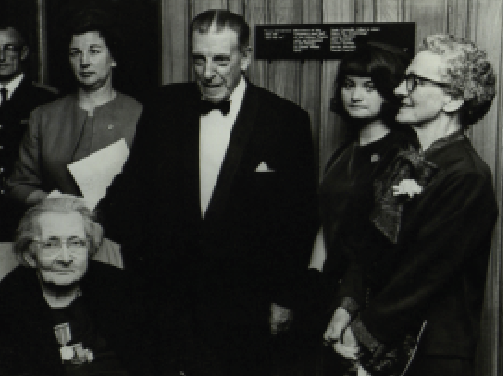 She gathered all this up and made it real for me.’ Following this epiphany, Molony joined Inghinidhe na hÉireann (Daughters of Ireland), one of the few organisations to facilitate political engagement by women, who were denied the vote and excluded from most political and cultural organisations. Although radical in terms of its commitment to feminism, separatism and (at least rhetorically) physical force, the gendered nature of Inghinidhe’s activities reflected the social conservatism of the times. The organisation had emerged from a campaign to organise a ‘patriotic children’s treat’ for children who boycotted the festivities marking Queen Victoria’s 1900 visit to Ireland. 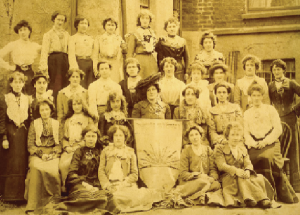 Focusing its efforts on women and children, Inghinidhe organised Irish classes for poor children, campaigned for the extension of school meals to Ireland, alerted girls to the dangers of consorting with British soldiers, pressured shops to stock Irish goods and discouraged British army recruitment. Molony later recalled how she evaded the authorities—‘we were young and swift, and the police were hampered by heavy long overcoats’—and ignored the disapproval of friends: the ‘suffragette movement had not been heard of and women and girls were still living in a semi-sheltered Victorianism’. By 1911 Molony’s activism had shifted from propaganda to agitation, reflecting her belief in the power of direct action to effect change. She became the first Irish female political prisoner of her generation after smashing an illuminated portrait of George V during the monarch’s visit to Ireland. Although embarrassed by her arrest—‘no one but rowdies went to the police station’—she was appalled to discover that her bail had been paid by Anna Parnell. As Áine Ceannt noted of her brief, if historic, incarceration: ‘She was let out—as a matter of fact she was put out’. At a demonstration following her release, Molony was thrilled when she was rearrested for denouncing George V as a scoundrel: ‘That was marvellous; I felt myself in the same company as Wolfe Tone’. By then Molony felt increasingly drawn to socialism: ‘I knew little of Labour ideas. But I was always on the side of the underdog’. Her column, ‘Labour Notes’, had brought her to the attention of James Connolly, whose ideas increasingly influenced her outlook: ‘I was fumbling at the idea of a junction between labour and nationalism’, she explained; ‘Labour and the Nation were really one’. She was attracted by Connolly’s egalitarianism, particularly given the labour movement’s ambivalence about women workers’ rights: ‘Connolly—staunch feminist that he was—was more than anxious to welcome women into the ranks on equal terms with men’. This left-wing trajectory was reinforced by her involvement in the Lockout, when she worked in Liberty Hall’s food kitchen and addressed strike meetings. An Abbey actor, she drew on her theatrical experience to outwit the police, disguising Jim Larkin as an elderly clergyman to facilitate his famous appearance on the balcony of the Imperial Hotel. The Lockout, Molony believed, ‘profoundly affected the whole country’, producing ‘a sort of social and intellectual revolution’. It also contributed to a personal breakdown, leading her to spend 1914 convalescing in France with Maud Gonne. Molony’s rebellion was short-lived. Captured in City Hall, she spent Easter week imprisoned in a filthy room in Ship Street barracks. After the Rising she was moved to equally squalid conditions at Kilmainham, where she was shaken by the executions: ‘Pearse and Plunkett were shot dead. Connolly was dragged out, unable to stand, and murdered. 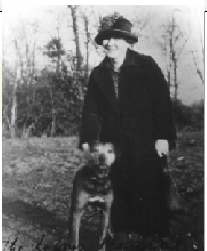 After that life seemed to come to an end for me.’ Following a spirited if unsuccessful attempt to burrow her way out of Kilmainham with a spoon, Molony became one of only five women to join over 2,500 male internees in England. She continued to cause problems for the authorities at the grim Victorian jail at Aylesbury, using her links with Sylvia Pankhurst’s Workers’ Suffrage Federation to publicise her conditions there. Throughout her life, Molony regarded the Rising—particularly its idealistic and egalitarian Proclamation—as the highpoint of the struggle for liberty. Her lengthy witness statement detailed her life before 1916, relegating the revolutionary years that followed to a short postscript. 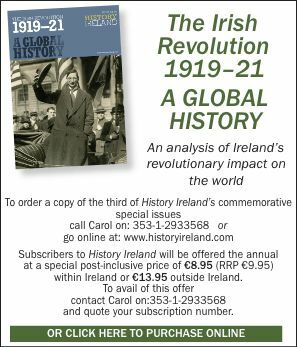 Returning to Liberty Hall in 1917, she described how Connolly’s execution resulted in a shift away from insurrectionary republicanism: ‘The union was in the hands of Larkin’s section. The Hall was in their hands too. We knew we had unsympathetic members in the back, and enemies in the front.’ She returned to the weakened ranks of the Citizen Army and used her position on the Irish Labour Party and Trade Union Congress, an increasingly moderate body, to advocate support for the sporadic efforts of workers to establish revolutionary soviets. She remained active in prisoners’ campaigns, rendering her a frequent target of arrests and raids by the British—and, later, Free State—authorities. A ‘patron saint of lost causes’, Molony’s criticism of the Vatican, support for the IRA and defence of the Soviet Union (which she visited) reinforced her marginalisation. Although elected president of the Irish Trade Union Congress in 1937, the second woman to hold this office, she was forced to retire from the IWWU in 1941. Although her retirement was attributed to poor health, her alcoholism, depression and embarrassing links with the wartime IRA had also played a role. She lived in relative poverty, relying on friends for support and accommodation. Her relationship with psychiatrist Evelyn O’Brien, with whom she lived until her death in 1967, has led some to claim Molony as a member of an influential network of lesbians prominent in overlapping feminist, socialist, trade union and republican circles whose sexuality has remained largely hidden from history. She has also been linked romantically to Bulmer Hobson and Seán Connolly. Well founded or not, such speculation highlights the relationship between gender, sexuality and power in post-revolutionary Ireland, and the troubling status of independent unmarried females in a society which valued women as mothers rather than as citizens. Fearghal McGarry lectures in history at Queen’s University, Belfast. A. Matthews, Renegades: Irish republican women 1900–1922 (Dublin, 2010). N. Regan, ‘Helena Molony’, in M. Cullen and M. Luddy (eds), Female activists. 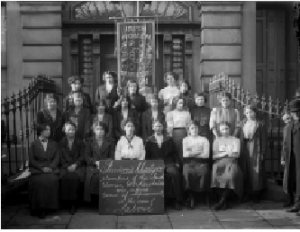 Irish women and change 1900–1960 (Dublin, 2000). M. Ward, Unmanageable revolutionaries: women and Irish nationalism (Dingle, 1983).